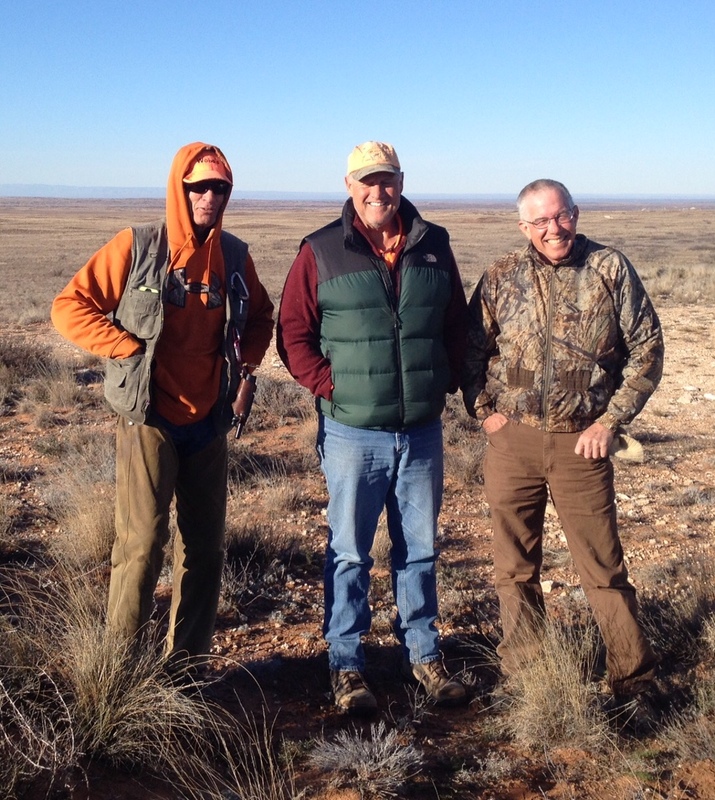 After the hunt in December was such a success, I knew another trip to New Mexico was in the cards. This time, however, Ruby was with her litter and it would be only Cap, Shack and Pearl. With only the three, I would need to be very careful about who ran when and also ensure their food and nutrition was top-notch (as I do every time). First, I needed to drop off one of my pups, to his owner in Nebraska, from training here in Georgia. You know, on the map, it doesn't look like much, but that was a long drive. The dog got delivered and the Brits and I found ourselves in Southeast NM, once again. I met up with Bob, Robert and Terry, all seasoned Blues hunters, and we hit the caliche roads looking for coveys. After hunting the area for 10 years, I pretty well knew where to go and I was very comfortable searching for new areas. I was most interested in getting my two pups, Shack and Pearl (M/F Brits- 2.5 yo) time on these birds, as they are known to be very difficult for a dog. It takes a solid, intelligent dog to handle these running devils consistently. I wanted my pups to get a lot of time on against them. It's a great year for that. Not once did we put dogs on the ground that we not rewarded with at least one covey, usually many more! There is nothing that trains a new bird dog faster than wild birds. Shack with a nice retrieve! A good afternoon for Shack. Another item I'm very involved in is the nutrition of my athlete dogs! I not only feed them a quality kibble (for me it is Royal Canin Adult Medium. I'm not going to get involved in the dog food debate, there are many good ones out there! ), but, when we are on the road competing or hunting, I also supplement their kibble with glycogen supplements, etc. Back in the day, one or the other of my dogs would "go off their feed" after a week or so and I would be scrambling trying to get them to eat. That's what led me to dog food research and Royal Canin, etc. Now, after a hard exertion, I give them a supplemental product called Glycocharge. I most heartily endorse this product and I've seen the effects over time. Of course, all my observations have been subjective and not scientific, but, in my opinion, this stuff works. On another note: Another product was recommended to me, which I used on this trip and during a 3 day field trial, is Elements Nutrition. They have products for recovery (similar to glycocharge), hydration, joint care, and an energy supplement. I used all of them this trip, especially the joint care, recovery and energy supplement. I believe them to be beneficial and will use them extensively for the next few months' field trials. I believe they are very much worth a look, if you are considering a supplement for your dog(s). In all, this was a great last trip of the year. The weather was perfect, not too hot or cold, and the birds were plentiful. I'm back home now, playing with my 3.5 week old puppies and imagining their futures as I smell the puppy breath. Cap and his haul- 6 covey points. Cap and Ruby pups! SOLD! Thank you!